By harrisonca on July 10th, 2009 . Filed under: Artwork, Tattoos . My best friend Jazmyn and I got cupcake tattoos together a few weeks ago! 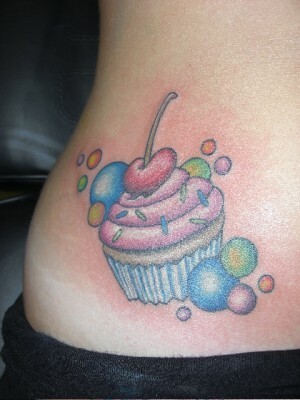 We were partially inspired by our obsession for cupcakes, and partially by the amazing tattoos on your website! Our tattoos were done by John at American Ink in Chattanooga, TN. 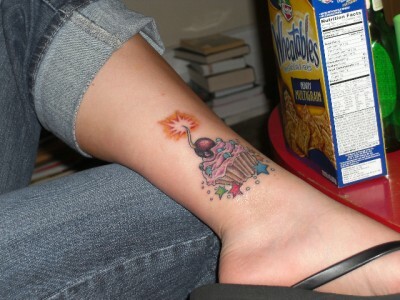 The cupcake with the bubbles is mine (Jessica) on my hip, and the one with the stars is Jazmyn’s on her ankle. i love your web sit its cool to know that im not alone in my passion for the cute sweet treats. If i could have only one wish for a day from a gennie it would be to be a pretty little pink cupcake. Love love love this design i have the same one on my foot i first seen it last year for the 1st time & since i’ve had it done its been everywhere love love love love it!!!! Helpful information. Lucky me I found your web site by chance, and I’m shocked why this twist of fate didn’t happened earlier! I bookmarked it.